First thing about this travelogue. I've been pretty slack at updating (as per usual to be honest) that this one had to cover an entire year. Money? I don't need no steenking money! It seemed as good a place as any to start the year. Liezl and I had spent the previous year in NZ, so this time it was the Philippines turn. We arrived in the Philippines a few hours before midnight on New Years Eve, courtesy of Kuwait Airways. Because we didn't have much time, we just hired a car from the airport (A cardinal sin I know!) and drove straight out to Mabitac. The graphic shots in the news each year apparently have reduced the number of injuries (although some sources say they haven't), but there still seem to be an awful lot of injuries. While I chaff at the restriction of freedom (No child growing up in New Zealand will experience the joy of blowing up hornets' nests with double happies any more, which is a shame) I have to wonder whether I'd prefer to retain those freedoms or try and protect people from their own stupidity but putting a blanket restriction on something like explosive fireworks. Spending time in the Phillipines is refreshing because these minor things are not yet restricted. At the start of the year (Jan 6th) is the festival of the three kings. Technically, this is the actual birthday of Christ (Although I've read a couple of interesting theories that figure it to be September 16th-ish). However, December the 25th was adopted by western churches something like 400 years after Christ's birth (don't quote me on this). From memory it was some Roman dude who was secretly a Christian who moved the date of the celebration so it fell on the same date as a couple of common pagan rituals, one marking the winter solstice. If that's wrong, then who cares... it sounds good enough. The point is, Christmas-time is all about money in the philippines. And Three Kings is the mother of all money-grabbing. And Mabitac is no exception. On Three Kings, everyone from the town gather in the plaza. Overhead, in the municiple hall, stand the Mayor Hon. Gerardo C. Fader, other local dignitries and possibly some prominent businessmen. After a bit of a speech, the people up in the hall start throwing coins (sometimes wrapped in a peso note of some denomination) down to the waiting villagers. The chaos is awesome. Some of the more cunning towsfolk hold inverted umbrellas to try and catch as many coins as possible, but the coin-throwers tend to avoid them and aim the bulk of their monetary payload in other directions. It's like the most mega lollie scramble! Another thing that is common around this time of year is the selling of coloured chicks to kids as pets. Now initially, I thought this was done by dipping them in food colouring. (Well, I did!) ...I thought that sort of explained why they all died so quickly. But no, it's a little more complex than that. I think the eggs are injected with food colouring at a certain stage and the colour is induced in the embryo. The reason they die so quickly is because they die of thirst. The kids sort of lose interest in them. Life is bloody hard in the philippines for humans let alone animals. After Three Kings, a group of us went and hired a private resort in Calumba. It had two pools, four rooms, a pool table and a videoke machine (essential for pinoy parties) all for £100/night. Sure that might be a lot compared to local rate, but this place was massive. Basically, we just swam, ate and drank the whole time. Definitely a good way to relax! After returning to Mabitac it was time to head off on another wee mini-trip, this time to Boracay. That aside, I loved the beach. Gorgeous white sand, beautiful warm water. You could swim any time of the day or night. I think I was still swimming into the wee hours of the morning most days. Stupidly I got a little burnt on the first day, so wore a t-shirt after that. (Slip, slop, slap you idiot!) I did have sunscreen on, but it wasn't water resistant - so immersing myself in water, then building a sandcastle wasn't the best idea I've ever had. Once we got back to Mabitac, Liezl fell ill. This time it was her turn for food poisoning. The only thing she'd eaten that I hadn't was a single oyster at a buffet in Boracay, so we sort of thing it was that. Fortunately she was more hardy that I was.. ..she was up and eating again only the next day (Although you could tell the edge was taken off her). On a whim, I entered for a competition for Sports Driver of the Year in the UK edition of FHM. It wasn't until after I'd entered that I realised I'd entered after the closing date, so I never really thought much more about it until I received a phone call at work. Apparently I was short-listed for the trip to Madrid to races Vauxhalls at Jarama race track. After quick rush around work to make sure I could get leave for the following week I was a confirmed entrant, off to Madrid a few days later. I met a couple of models dressed in FHM gears at the Airport and followed them to the meeting point. After checking in and going through to air-side, I met up with a bunch of guys who were looking through the latest magazine trying to spot the guys who were featured as competitors. Turns out none of those were actually competitors (possibly FHM just made them up since they've got quite aggressive publishing deadlines). Short flight to Madrid (I sat next to the beautiful and funny Tillie on the way out... had a good wee chat), and off to the hotel for dinner. For some reason the restaurant though we only wanted to eat meat. We had forty guys (and other crew) who were served meat, but no vegetables... because someone had forgotten to order something to go with meat. Apparently the hotel thought we were a carnivore convention or something and didn't question the odd menu choice. They managed to rustle up some chips as well, but that was it for the night. We had a day of doing four different driving events. I had a pretty shaky start (with almost the worst time) when I stopped at one point thinking I'd completely missed a turning, but managed to pull it back to finish up 4th at the end of the first heat. Doing a handbrake parking manouver between two parked cars was the most fun for me. That night we went to Bernabeu stadium to watch Real Madrid win against Real Beatis 3-1. At the end of the second heat, out of the 39 competitors (one didn't make it because he couldn't get the time off), I gained a place to come 3rd overall, which was good enough to make the final. The final stage was just 4 driving events. And I've got to admit, I drove pretty poorly. Couldn't get to grips with the reverse selector in the Astra. My fault for driving automatic left-hookers for the past 7 years perhaps? The only event I got a good score in was the entertainment portion (a sneaky 5th event) where you had to entertain the trackside totty. It's only thanks to the Kiwi haka that I manage to pull anything out of that one too. Also, our scores were reset so it was only down to the days events. Our final night in Madrid was a yummy dinner and drinks at Bernabeu again. A few presentations and speeches etc... And it was all over. I had a great time and loved doing burnouts in the VXR Monaro. And in a way, I'm glad I didn't end up on the podium with a shot at driving touring cars. It's something I'd have loved to have had the opportunity to do maybe 10 years ago, but I don't have the energy/passion/drive for it now. The funniest moment of the whole trip for me was when we were in the bus and going under a bridge while Nicky (the organiser) was talking. Nicky asked if we could still hear her on the intercom as if the bridge would interfere with it somehow. Legend! Dubai has an insane number of vehicles on the road now. When I lived here 5 years ago there must have been half as much traffic or less. It's absolutely crazy now. I can't get over how long it takes to get from point to point now. It looks like the place has been a victim of it's own success. Also, I'm not sure it's possible, but the drivers have gotten more aggressive too. I had one local lady, sitting behind me in her massive 4WD, shooing me off the road because I was in her way. The fact that it was bumper to bumper traffic didn't seem to register to her. Met up with Will (A mate I used to work with) at Scarletts for several pints. He might have some grey hair, but still looks like he could out-surf anyone 20 years younger. He's driving a TVR around now, which is a hell of a car. Not, perhaps, the most practical for heading down to Spinneys to do the shopping in, but definitely the thing for blatting out to Jebel Hafeet and back! There was quite good surf on the beach too. Enough to bodysurf a decent distance if you caught the wave right. The biggest difference about the beach that I noticed was the view. It's been ruined by a ton of land-reclaimation ships that constantly spew sand/earth during the island building process. But the end result should be spectacular! I happy to see that my Arabic language skills haven't totally deteriated. I'm a lot worse than I used to be, but I can still read Arabic (enough to read transliterated signs at least or a few of the arabic words I haven't completely forgotten) Still, most of the trip involved eating, which seems to be my new hobby. It blows me away how good the food can be out here. Also, the sheer number of waiters a restaurant can comfortably sustain. The economic model is completely different in the Middle East than say the UK. For instance, we went and ate at Arous Dammascus, where no less than 10 waiters were serving about 20 diners. A restaurant in the UK could probably only afford two or three waiters at most for a similar turnover. But the labour costs are so much cheaper here. It's similar in the Philippines too. Service is fantastic! One of my biggest disappointments was to find out that Nelson Casili was no longer performing at Jule's bar! Now, it's all rumour, but I heard that a son of a certain famous family in Dubai (I'm not mentioning the name in case this is untrue), went to Jule's bar and was offended and had him deported. If there is any truth to that then I'd say Dubai has lost one of it's greatest assets. Nelson was/is a fantastic performer! My favourite (along with so many other people) was to sing along with his rendition of Hotdog's 'Manila'. So far, if there is one place that reminds me of home, or at least the South Island, it's Switzerland. We'd had a bit of a reshuffle at work (one of many) and that required the three of us (who were based in the UK) to head out to Zug to meet the rest of our new European team. Turns out, it was a great trip. I particuarly like the food in switzerland. They just seem to do it so much better than anyone else! Only one of our meals was 'average'. And even that could be forgiven since it was on a boat that was cruising the lake in Zug. My only down-side to the trip was not being able to sleep. I didn't sleep for almost the entire week I was there. (Almost a wreck by the end of it) I still don't know what caused it. Very strange! My first stop after the ferry was to head to Troyes for a couple of days. It's a little east of Paris and is full of amazing architecture. I just wandered around enjoying the sights. It's meant to be pretty famous for art too, but I didn't get past exploring the streets and restaurants. The evening that I arrived was pretty wet and horrible. But fortunately the next day it was gorgeous and sunny, so I spent the next couple of days on the beach just swimiing, building structures out of the pebbles/stones near the water and soaking up the sun (careful not to burn though). Also went for walks to build up an appetite, since the food was fantastic no matter where I ate. This storm was out over the mediteranian and completely filled my peripheral vision. Each lightning discharge lit the sky with jagged white cracks and a huge thundering sound. I was like a kid seeing his first massive fireworks display. Wow! The next day the weather was clearer (nothing brilliant, but nice enough to spend some time in the slightly-too-cool pool). An English Lotus club had stopped overnight at the hotel as well, my boxster feeling completely outnumbered by the Esprits. We spent a couple of days in Nice and were meant to head to Montpellier for our next stop, but I'd enjoyed Le Dramont so much I rearranged things so we could spend another couple of nights there. Our next stop was Empuria Brava. After Le Dramont, Costa Brava seemed completely soul-less. Or more specifically Empuria Brava is... Nearby Cadaques makes up for it though. (Salvidor Dali reputedly said that it is the most beautiful village in the world.) I guess the reason for the lack of soul is that the place has been made especially for tourists. Sure the beach was nice (at least it had sand) and the food was pretty bloody good (and pretty cheap for what it was), it was still vaguely unsatisfying. We had an uneventful, and relaxing, couple of days just chilling on the beach before heading to Barcelona. We'd decided to stay a bit out of town (in Montmelo) since by all accounts it's crazy to try and drive in Barcelona. But we had some fun getting a room that a) had working a/c and b) that was vaguely clean and had a toilet in working order. We settled on the third room we tried (with it's attendant faults) just so we could have a short rest before blasting into town for dinner and drinks. One thing that Barcelona has a lot of is graffiti. I love the works of Banksy , but a lot of the stuff in barcelona is either bombing or just rubbish tagging. I definitely prefer graffiti/stencil-art with a more political bent. But some of the bombing was pretty well done. We tried to eat dinner back in Montmelo, but were struggling to find a restaurant that wasn't a tapas place. Apparently, there was only one restaurant that would fulfill our needs. Not speaking much Spanish (and the Spaniards I met didn't speak English) I ended up getting directions in French from an Italian (who spoke Italian, French and Spanish - perhaps English too, but he was taking the piss? lol). Fortunately my French was up to the task and we managed to get a nice meal to chow down on. Don't get me wrong here though, I love tapas... but we'd been eating tapas for ages and just wanted a nice big steak to munch on! Only bugger is, when they served the meal, Liezl's lomo had turned into pollo (chicken instead of pork) since they'd run out, but didn't bother telling us. After a few days in Barcelona, it was time to head off to the mountain town of Jaca, south of the Pyrenees mountains. Unfortunately, while windy mountain roads were a lot of fun when I was on my own and driving down to Southern France, apparently it isn't as much fun if you are a passenger. 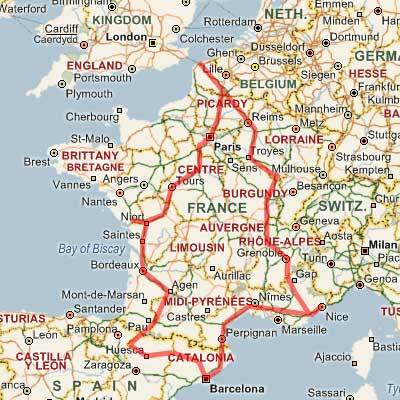 So we ended up making terrible progress along our initial route which took us close to Andorra. So instead I had to cut south a lot further than planned so we could take the straigher/faster roads. As it was it was pretty late when we arrived at Jaca. Also, my GPS wasn't really up to the task of finding our hotel. The waypoint got us most of the way there though, which was the whole point. Next morning Liezl finally managed to have her chocalat con churros (which were slightly disappointing) and I just had pain & cafe. I also needed to buy a t-shirt since we were running out of clean clothes. Laundrettes were pretty commonplace in France, but were bloody hard to find in Spain! After getting some supplies we headed off to Torlos and caught a bus up to Ordessa parc. Liezl isn't huge on outdoorsy stuff, so a few hours in and back was about all we could manage. I may have to come back on my own to hike the GR10 or GR11 trails. Our meal back in Jaca was pretty funny. After some translation fun, managed to order the veal steak (again, mostly in French since my Spanish is non-existant... I must remedy that). But when it came out it was Bleu... and I mean Bleu. Fortunately I like my steak very rare, but this was Rare! So I cut a sliver and had a mouthful of some incredibly nice (but rare) veal. That's when the waiter brought out an incredibly hot ceramic dish for me to cook my steak on. Lol! The nice thing about the hotplate, is I could share my veal with Liezl, she could have her's à point (medium-rare) and I could cook mine saignant (rare). Driving back to France, we took the longest tunnel I've ever been in. I think the speedlimit was 80kph and we must have spent at least 6 minutes driving through the tunnel. That's something like 5 miles (8km) long. Now, I know Norway has the longest tunnel you can drive through that is about 3 times as long, but even so this was damn impressive considering the longest tunnel I've seen in NZ is the one from Christchurch to Lyttelton that is something like 2km long. Finding our hotel in La Rochelle was a little stressful. It was one of the two hotel that Liezl had booked and I didn't have a waypoint (and she didn't have directions). After struggling with the one way system for 20 minutes, we ended up parking and walking into the center to find where is was we were staying. Parking was a bit of a nightmare, but I managed to navigate a route to get the car to the hotel so we could unload our bags, then found somewhere not too far away to park for the night. Our mission the next day was to find a landrette since we were in desperate need of clean clothes. The town market was open with all the fresh fruit, veges, fish and meat (mostly fish) you could shake a stick at. There is a lot to be said shopping the provençale way - just the freshest food, one day at a time. We spent a couple of days just eating/walking/drinking/sleeping before heading to our last stop before home. Paris. I'm not going to go on about Paris too much. Some of the hilights were; Liezl spotting someone with a Starbucks mug and desperately wanting to find the shop because she was pissed off with small coffees all the time (we didn't find it). Eating at an amazing italian place, served by an Egyptian waiter and a french flair to the food. Cycling around central paris with a bunch of whooping Americans (Good laugh). Picnicing in various places with all the great food that is available in almost every shop (The French get it SO right!). Pretending not to be able to understand english to all the hawkers (or whatever they were) who tried stopping us as we walked around (I only spoke in Arabic or Tagalog in reply). One thing that has changed is all of the defences around the American embassy. The place looks pretty fortified now. It might not stop a motorcycle packed with explosives (Although the armed guards probably would), it is still a good indicator of how sad the world is that we currently live in. Not that I think it is more dangerous than at any other time... but there is more of an aura of fear than in any time that I'm aware of in the last 3 decades. Leaving Paris was one of the longest drives of the whole trip. We'd left it a bit late and managed to hit rush-hour. So it took a lot longer than planned to get to Dunkerque. We ended up stopping in Arras for our last dinner in France at a restaurant called Eurostar. Fortunately the food was fantastic. Unfortunately, the wine was equally good - but I still had a wee way to drive before we got to our hotel so couldn't really appreciate it the way I would have liked. Two kiwi ladies were talking at a table next to us. Normally, I'd have butted in and said 'Hello', but this conversation sounded pretty deep and I didn't want to interrupt. Finding our hotel in Dunkerque was a little bit of fun too. We were incredibly late (and the hotel didn't have 24 hour check-in). But I managed to jimmy the doors and wake the manager :-) who grumpily gave us our room. What I was most proud of, is I managed to explain how sorry I was that I was late, but we had a reservation for a room - all entirely in French. Sure, gramatically I reckon it was pretty poor, but it still made me chuffed to bits. I was a little slow when she asked if I'd like breakfast... but I managed that in French too. We had one more trip to the Philippines at the end of the year (which went over New Years as well), but this travelogue has gotten long enough! Thanks for reading, and I'll catch you next time.